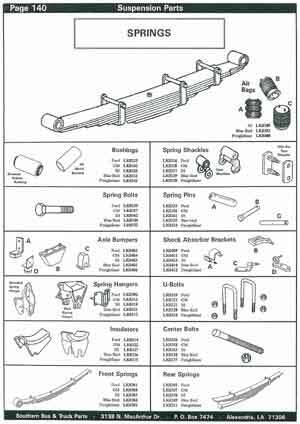 Looking for Leaf spring parts for the suspension on a school bus? spring suspension on a school bus. Our database is filled with part numbers and information covering the parts you need. We can even furnish parts for buses built by companies that have gone out of business. 2. Part description - where it's mounted on the bus, what part "does"
3. Bus chassis brand - IH, Ford, Freightliner, Vision, GMC, Chevrolet, etc.